Golf has quickly become one of the most popular sports to bet on in the world. The main reason for this is that it’s so accessible these days. There is a tournament going on somewhere in the world almost 52 weeks of the year and it’s this sort of consistency that professional bettors thrive on. The coverage of the game is now as big as ever as well. The UK have fantastic coverage of both the PGA Tour and European Tour from Sky Sports, whilst the US have a dedicated cable channel, appropriately named the Golf Channel, which shows nothing but golf around the clock. Coverage on this sort of scale not only propels the popularity of the sport but it also increases the likelihood of bookmakers covering these events in greater detail. If they know the audience is there, then it’s safe to say that most bookmakers will provide a thorough market. This can only have a positive impact on golf bettors; bookmakers are always looking for ways to outdo each other, and this competition is extremely beneficial for people like you and me who are looking for the most comprehensive golf betting section and the best odds. Coral top our list with one of the most complete golf packages that we have tested. Their opening positive comes in their market coverage. It’s often interesting to see which sites take bias to a certain tour, if any. What we’ve found, and you will be able to read this below, is that often one tour gets more coverage than the other. Coral seem to have found a nice balance in what’s on offer from their site giving both the PGA Tour and European Tour excellent coverage. The money lies within the PGA Tour, but we think that their Irish roots make the European equivalent fall close to their hearts. Coral always seem keen to offer up ante post markets which, if you are familiar with golf betting, will know that this is something that isn’t all that common. At the time of writing this article we are coming towards the end of the season (mid Fed Ex Cup) but Coral already have markets up for all of next years majors and even markets on the Ladies majors. Coral have recently introduced their ‘Golf Guarantee’ promotion as well which means that they offering live betting from the very first tee off on the first day right through to the last putt on the last day. To be honest, we didn’t actually realise that this was a ‘thing’ as such, but it turns out it is! If you are looking to bet on markets from the get go, then Coral must be somewhere that you try out. As a final point, we just want to make you aware that Coral run multiple offers for golf throughout the year. They range in how generous they are but you can often find enhanced prices for players and even acca insurance if one of your picks lets you down. Keep an eye out around the time of the majors as this is often when they are at their most generous! BetVictor take second place in our golf betting section and to be honest, it was nip and tuck with them and the others below. BetVictor continue to provide a really solid betting alternative to Coral for golf. They are a company who tend to not do thing by half’s and whilst it’s been tough for them to ever really grasp that top spot in any of our sports betting reviews, they have never been far away. They cover a really strong array of competitions and whilst both tours are covered, they probably cover the women’s game as well as anyone. Their markets are of a good standard, without ever really being mind blowing, but they are able to offer some interesting selections such as their 3 and 2 ball markets that are perfect for forming an accumulator bet, if you so wish. There isn’t a massive amount of extra features to choose from on site, but as a final point, and arguably most important, their pricing is consistently right up, if not best priced on a lot of markets in the industry. If you are a player that isn’t all that bothered about the gimmicks and all about making sure you get an ultra competitive price on your bets, then BetVictor are an easy choice for you. 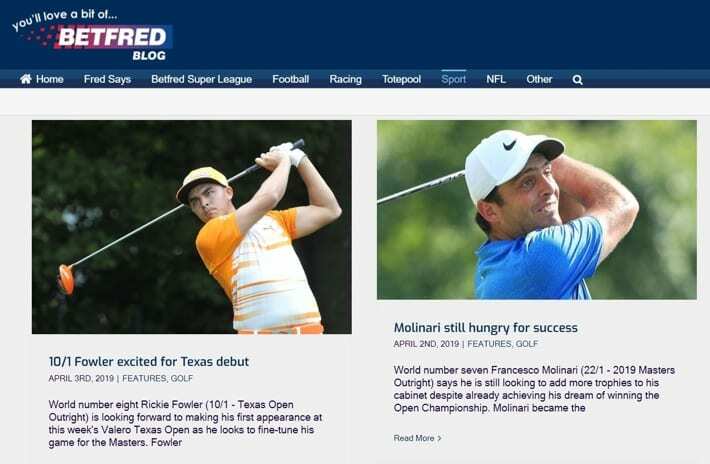 Not a bookmaker known for their golf coverage, Betfred have actually made quite a few strides in terms of coverage of the sport over the last few years. This arguably says as much about how popular golf has become to bet on than anything else, but it’s always nice to see bookmakers expand. They don’t really do anything out of the ordinary or anything that the above bookmakers don’t do. They have good market coverage, they provide interesting live betting options and they also have a more than competitive pricing structure as well. As we said, nothing really out of the ordinary, just a really solid golf section that would be fine to use for most bettors. Their highlight probably comes from their coverage of the LPGA (Ladies Professional Golfers Association). There are bookmakers out there that do include LPGA matches, but Betfred seem to cover them most weeks, which is the best coverage we have come across so far. If the ladies golf game is something that you interested in betting on, then we reckon Betfred will be your best bet! Ladbrokes make up our final position, but that’s not being detrimental to their golf betting section. Unfortunately for them, above are four bookmakers that are about as solid as you are going to get for the sport, and whilst Ladbrokes do a steady job of keeping up, they don’t quite include quite as many markets or have that consistently competitive pricing that the other four do. We’ve mentioned their new design before, but we must say it seems to work particularly well with golf. Often when you are betting on more than one market it’s tough flick between more than one market but the new design allows you to bring several markets that you are betting on to one page to manage them as they progress. It’s a small feature but it’s something that we were really pleased to see included. One of the best things about golf getting so much more exposure is that there is consequently much more information available to you from reputable sources, allowing you to make much more informed decisions on your bets. One thing we would highly recommend is using these sites to see who’s betting on what. There are multiple bookmakers that actually employ people to write these articles which you can access for free. One other tip is that the majority of these people will run social media sites, such as Facebook and Twitter that are gold mines of information – you can even find ex and current pros offering their advice on betting picks. Of course you will need your own knowledge too so read around the players and the courses, double check their form, and make sure you have a look at a few different betting sites to get an idea of where the best value can be found. Sometimes, slightly better odds can be beaten by another bookie that are running and offer, for example. Win Outright – Pretty self-explanatory, basically choose which player you think will win the whole tournament. Top 10 Finish – Select which player you think will finish in the top 10 of the tournament. Top European/American/Australian/Rest of the World – Choose which player from each part of the world will finish highest ranked. If two or more players are tied then bookmakers will pay out on all results. 1st Round 3 Balls – You can select the winner of the 3 ball groupings. It doesn’t matter where they are in the tournament all they need to do is be the highest ranked player from that three ball. 1st Round Leader – Simply choose the leader of the tournament after the first round. Their ultimate finishing position is irrelevant. Top 5 Finish – Select a player to finish in the top 5 at the end of the tournament. Any tied positions are included in this market. 1st Round Six Shooter – A bookmaker will select 6 players out of whom you need to predict the highest ranked at the end of the first round. It’s worth noting that markets for the above 1st round selections will change to 2nd, 3rd and 4th round markets when the time comes, but the bet works the same way for every round. Betting on the outright winner is the most popular bet type in golf betting. It’s a pretty simple concept that barely requires an explanation, it’s a simple case of predicting the winner. Should two or more players scores tie after the tournament has been completed, the bet will be based on the winner of a playoff. 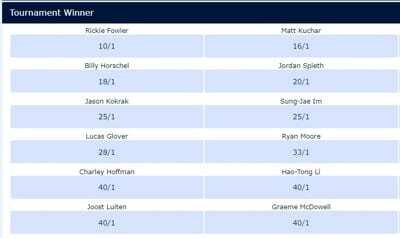 One of the best things about the outright winner market in golf is that the odds are always massively favourable for the punter, although sifting through hundreds of players to make just one selection is often tough. A clear favourite could be priced as long as 15/1, which is almost unheard of for a favourite in any other sport. The each way bet essentially splits your stake into two bets; the first being a bet to win the tournament and the second for that player to finish within the place spots. This is usually around 6 places with most bookies, so the bet would win if your sleection finished 6th or higher. Again, because of the huge odds on offer, each way betting is very popular with punters, as even place bets at a quarter of the odds will still be lucrative. 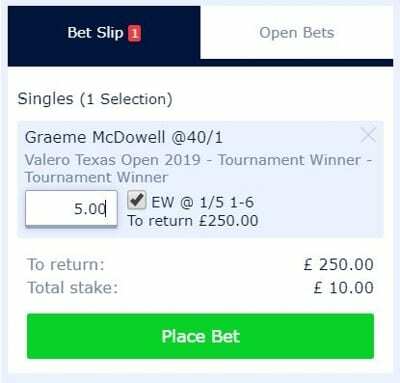 An example might be that you back a golfer at odds of 40/1 each way. You stake £10 in total, meaning £5 on the win and £5 on the place. The bookmaker in question is paying 6 places for the place bet at ¼ odds. Your pick manages to finish second, which means you lose the ‘to win’ part of the bet, but you win the place part. ¼ odds of 40/1, reduces that to 10/1, meaning your £5 place bet still returns a tidy £50 for your troubles. Not too shabby. If your selection had come in 1st then you would win both bets, so you would claim the £50 from the place bet as well as the 40/1 odds on the win bet. As a final point on the example above, a 40/1 place bet might seem like a rank outsider, but in all honesty, because of how golf is priced, it really isn’t, and often a 40/1 bet will still have a really strong chance of winning the whole tournament should they have a good week. Group betting is a little lower variance than most bets and allows you to simply back the winner of a group of three. Hilariously, these bets are often called Tournament Threesomes – what happens on the 13th hole, stays on the 13th hole… Sorry. For those of you that don’t know, the first two days of the tournament (at least) sees players head out in groups of 3, meaning that instead of betting on one player to win the whole tournament, you can bet on one player to win their group. The odds of group betting will be much less than that of backing the overall winner for obvious reasons, but in turn, the variance will also be much lower, often making for a more engaging bet. These types of bets are also great for combining as multiple bets or accumulators if you prefer. 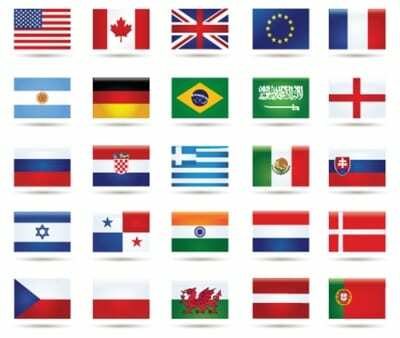 Betting on the top country means that you need to select the nationality of the player(s) that you think will win the event. So, instead of choosing the exact player, you can simply pick the country where the winning player comes from and so effectively bet on a handful of players all at once. These types of bets are good when there are a couple of players from the same country who you think might have a chance. Obviously betting on a PGA Tour event is going to be massively stacked towards an American winner due to the number of American’s on the field, but if you target a European Tour where the mix of players and their countries is much more diverse, then these types of markets really start to come into their own. The first round leader market is pretty self-explanatory really. You need to bet on who you think will be leading after the first round and only the first round, meaning that what they do after this in the tournament is irrelevant. For these types of bets to be successful you need to look out for explosive players who are great at getting out of the blocks quickly. For example, Dustin Johnson is a player who can simply rip a course to shreds with his distance. What many PGA Tour events do is set the course up in a much more golf-friendly manor for the first day and increase the difficulty as the week goes on. While the course was in its ‘easy’ stage players like Johnson are able to go out and make multiple birdies, but as the course toughens up, especially over the weekend, these players could fade away somewhat under the pressure – although this is not always the case, Johnson himself has he’s taken down the US Open. Note: Johnson averages 68.23 strokes in the first round of any event on the PGA Tour at the time of writing, and stats like these are going to be crucial to take into account when forming your bets for this market. As with all sports, there are times when unforeseen circumstances arise and an event cannot be completed. 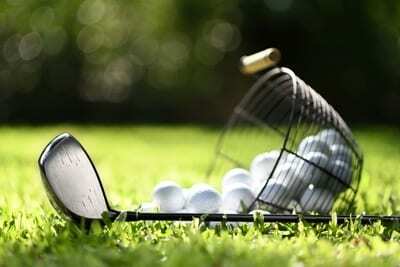 Golf requires at least 36 holes to be played for the result to stand and essentially the result will come down to whoever gets awarded the trophy at the end of play. Generally though, if the bets have been settled then the result will stand and the price will be paid as if it’s been completed. Each way betting is a tricky area when it comes to betting on golf. Dead heat rules will apply to positions that are taken up by multiple players. If more than one player is deemed to have finished in the paid positions for this market then the winnings will be divided by the number of players holding these positions. For example, most bookmakers will pay out at ¼ the odds for these places. The odds for the players in the placed positions will then be divided by however many there are. So a 20/1 pick would be quartered to 5/1 for the place, then, depending on how many other players are in this spot, will be divided again. Group bets will be paid out to the player with the lowest score after the allotted number of holes. If you are betting on just groups then in the event of a tie dead heat rules will apply. If you are betting on groups for the entire tournament then ties will result in a push and stakes will be refunded. If a player withdraws prior to them hitting their first shot then all bets on that player or that are affected by that player will be void and returned. If a player has hit their first shot and then withdraws later in the round then all unsettled bets such as outright, group match or 18 hole bets will be deemed as lost. In addition, when a player withdraws from the competition before it starts then bookmakers are allowed to bring in Rule 4 which means they can change the matched odds prices on the rest of the field. Depending on the odds of the player omitted from the event will depend on how much the odds change for the rest of the field. The PGA Tour is widely regarded as the most prestigious of all the golf tours in the sport right now. It includes the biggest tournaments with the highest prize funds and the best players competing each week. The PGA Tour has been running since 1929, and since 1994 Tim Finchem has been the man in charge and is widely regarded as the driving force behind the tour’s success today. 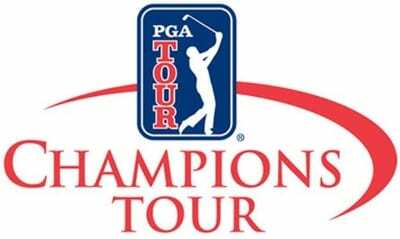 The PGA Tour also has a number of smaller tours such as the Champions Tour (for players over the age of 50), Web.com Tour (for professionals yet to qualify for the PGA Tour), PGA Tour Canada, PGA Tour Latinoamerica, and more recently PGA Tour China. The Tour runs for the majority of the year and includes events all over America. They also include a handful of events outside of the US, most notably the CIMB Classic in Malaysia, which is the first PGA Tour event sanctioned outside of the US. They are widely reported to be in discussion to offer up more events outside of the US, such has been the positive response of the CIMB in Malaysia. The season pretty much follows the weather in the US, starting off in January at Hawaii. It then works its way around California and Arizona, before moving to the South and South East during the autumn months. Each section is often referred to as a ‘swing’, such as the ‘West Coast Swing’ and the ‘Southeast Swing’. Players tend to play around 20 to 30 tournaments a year and must either have event exemption, qualify or be invited to each event. The highest profile events on the tour include the Players Championship, 4 World Gold Championship events, Honda Classic, Buick Invitational, and the Sony Open. Throughout each season the players will work their way towards the Fed Ex Cup, which is decided on an accumulation of points earned throughout the season from each tournament. At the end of each season, the top 120 players in ranking points will enter into the Fed Ex cup where they will play for the chance to win a 1st place prize of $10million. The Fed Ex Cup is played over 4 events, starting with the Barclays, followed by the Deutsche Bank Championship, the BMW Championship, before the finale which is the Tour Championship. After each round the field will be cut and the top 100, then 70, and finally 30 players will advance. The winner of the money list is often regarded as the best player from that season of the PGA Tour. In 2015 Jordan Spieth broke the record for most money won in a single year taking home just over $12million – $1.5million more than that of Vijay Singh in 2004. But it’s Tiger Woods who holds a lexicon of records on tour with the most overall prize money won at $110million, some $23million more than that of Phil Mickleson in 2nd place. Woods also has the most player of the year awards with 11 and most money titles with 10. The European Tour is the prize tour for those players wanting to compete in and around Europe. It lives somewhat in the shadow of the PGA Tour, but its status is still highly regarded, with huge amounts of money involved. The tour has been running since 1972, making it relatively young in comparison, but the way in which it is run allows much more flexibility in terms of where they hold events, often outside of Europe. 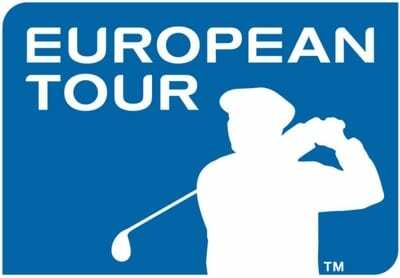 In an effort to increase exposure of the tour and also to increase the overall standard, the European Tour has ventured to many countries outside of Europe. To be honest, despite its name, the tour is these days much more about the global appeal of golf, holding events in the middle east, China, India, Africa and even the Americas. The tour is all about the Race to Dubai, which is the equivalent of the PGA Tour’s Fed Ex Cup. Points are scored on each tournament that is played and the players who are ranked in the top 60 will then take part in the Dubai World Tour Championship in November, signalling the end of the European Tour season. The total prize money on offer is $8million, with the winner getting a cool $1.5million share of the pot. Since the tournament has moved to Dubai, it’s reported that it delivers upwards of $44million in gross economic benefit to Dubai. Lee Westwood, one of the European Tour’s stalwart ambassadors, is the leading career money winner on tour with over £31million in earnings. Colin Montgomerie has won more Golfer of the Year titles than anyone else with 4 and Seve Ballesteros has won more European Tour events, with a staggering 50 to his name. The LPGA is the Ladies Professional Golf Association and the strongest female only tour in the world. The tour has actually been running since 1950, but it’s only over the last 20 years that the standard of play, and in turn the prize money, has really started to draw attention. In fact, in 2014 the tour reported that prize money had surpassed the $56million mark, which was an increase of almost $15 million from the same time 5 years prior. The US women dominated the tour for the majority of the early years, but an influx of both European and especially Asian players has seen this shift somewhat with 31-40 major champions between 2000 and 2009 being non-Americans. The LPGA has 5 major tournaments on their roster, compared with just 4 in the men’s games. These are the ANA Inspiration, Women’s PGA Championship, IS Women’s Open, Ricoh Women’s British Open and The Evian Championship. Similarly to the men’s game, they have a tour ending tournament in the form of the LPGA Playoffs, which includes the top 120 players from the tour generating a total prize pool of $1.5million with $225,000 going to the winner. The Champions Tour has been running since 1980 and is available to players who are over the age of 50. 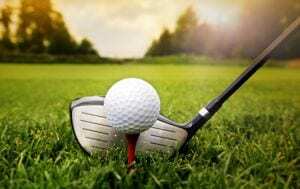 Most players will have played some form of professional golf in the form of the PGA Tour or the European Tour, but there are some who qualify after having no experience of either. The tour is seen as a way for players to continue playing competitive golf, but on a much more level playing field. Golfers such as Bernhard Langer and Colin Montgomerie have had resurgent careers as a result of the Champions Tour. The tour itself is primarily set out in the US, but there are events outside of these borders such as the British Open along with tournaments in the Dominican Republic, Canada and in 2010, South Korea. The purse throughout the 2010 season was reported to be in excess of $50million, with almost $2million up for grabs in each event that was played. Similarly to the PGA Tour, the men also have an end of season playoff tournament, called the Charles Schwab Cup. This includes the top 72 players in the money list from throughout the season with $440,000 going to the winner. Hale Irwin has won more money on the Champions Tour than any other player with over $26million, $6million more than second place Gil Morgan. Bernhard Langer has won the most money list titles, with 7 in total. In fact, what makes Langer’s feat even more impressive is that he won 7 out of 8 money lists from 2008 to 2015. The Masters is the first of four majors on the golfing calendar and is widely regarded as one of the most prestigious events on tour. The tournament has been running since 1943 at Augusta National Golf Club, Georgia. The whole site of the course is one of absolute beauty and the course itself is easily one of the best in the business. In fact, it’s been reported that they take so much care with the aesthetics, that if a branch needs to be cut from a tree they will paint over where it’s been cut so as not to stick out. The Masters is also unique in that it’s the only one of the four majors to be played on the same course every year. The tournament will take place our 4 rounds starting on a Thursday in April and finishing on the Sunday. Each player will play 36 holes to start with then the tournament will endure a cut, meaning about 1/3 of the field will be removed and not play at the weekend. The weekend’s matches will just be in two balls, whereas the first 3 days were in 3 balls. The best score after 72 holes will be crowned the winner and a playoff used if two or more players are tied. Jack Nicklaus has the most Masters wins with 6 in total and he was also the oldest winner of the event at the age of 46 years and 82 days in 1986. Gary Player has played more Masters events than any other player, with 52 appearances in total. He also holds the record for most consecutive cuts with 23. The U.S Open is the second of the four majors, that takes place on the third Sunday of June which just so happens to be fathers day. The tournament is revered as one of the toughest tests in golf with only a handful of the toughest US golf courses chosen to host such an event. Unlike the Masters, the US Open will jump to a new course every year, often searching out which will be the toughest. The US Open also has the highest aggregate score of any major, underlining just how difficult a test it can be. The tournament will span over 4 days, starting on the Thursday and then working through until the Sunday. The field for a US Open is much larger than most with around 160 players starting out. After two rounds a cut will be made with around half the field being removed. The remaining players then take part over 36 holes through Saturday and Sunday, with the player that has the lowest aggregate score after 72 holes being crowned the winner. Jack Nicklaus, Willie Anderson, Bobby Jones and Ben Hogan hold the record with 4 victories each, the lowest amount for any one player in major history. Interestingly, there have only ever been 6 players who have shot all 4 rounds under par in the tournament’s history, with only two of those players failing to go on and win the event. Rory McIlroy holds the record for most strokes under par with 16 under in 2011. The Open is the oldest of the four majors after it was first held in 1860 over 150 years ago. The tournament is always held in the British Isles and interestingly there are only 10 courses that are on the rota; 5 in Scotland, 4 in England and 1 in Northern Ireland. The courses all have two things in common, they must be a links style course and the difficulty must be extremely high. Probably the most famous venue for The Open is St Andrews in Scotland, often referred to as the ‘Home of Golf’. The tournament follows pretty much the same format as any other of the four majors in that the field – often around the 160 mark – is then reduced after 36 holes by the ‘cut’. The remaining players then play another 36 holes – so 72 in total – before the player with the lowest score is crowned the winner. The Open also recognises who will be the lowest amateur for the tournament as well, picking up the Silver Medal. An amateur will have to at worst make the cut to be awarded this medal. One of the most bizarre yet entertaining records associated with The Open is the current oldest and youngest winners of the event. The oldest winner is Old Tom Morris who won at the age of 46 in 1867. The youngest was Young Tom Morris who won at the age of 17, just a year after his dad in 1868. Harry Vardon has the most Open victories with 6 in total and Jack Nicklaus holds the most runner up finishes with 7. The PGA Championship is the final major of the season, and the last chance a player has of capping off a successful season. Like the two majors it follows, the location of the event will move each year around the US, looking for tough courses but possibly not on the same scale as the US Open, with parkland courses being included along with coastal courses for this event. The tournament will usually take place in mid-august, prior to Labour Day weekend in the US. The tournament’s structure will be very familiar to most in that there are 4 rounds played from Thursday through to Sunday. In that time players will play 36 holes before a cut is made and the field is drastically reduced. The remaining players will then play the final 36 holes to find a champion. In the event of a tie, players will go into a sudden-death playoff. Jack Nicklaus and Walter Hagen are the two most decorated players in the tournament’s history with 5 wins apiece. Nicklaus also holds the record for most runner-up finishes, with 4.